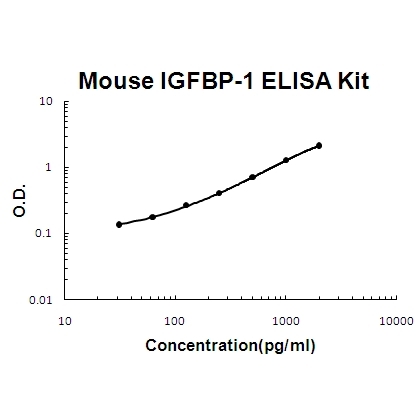 Sandwich High Sensitivity ELISA kit for Quantitative Detection of Mouse IGFBP-1. 96wells/kit, with removable strips. IGF-binding proteins prolong the half-life of the IGFs and have been shown to either inhibit or stimulate the growth promoting effects of the IGFs on cell culture. They alter the interaction of IGFs with their cell surface receptors. Promotes cell migration (By similarity). .
IGFBP1 is also known as amniotic fluid binding protein(AFBP), placental protein-12, alpha-pregnancy-associated endometrial globulin, growth hormone independent binding protein, binding protein-28, binding protein-26, and binding protein-25. The low-molecular weight insulin-like growth-factor binding protein(IGF-BP25) is synthesized by human liver, secretory endometrium and decidua, and is also present in human serum. It binds insulin-like growth factors IGF-I and IGF-II with high affinity, and is proposed to act as a paracrine regulator of cell growth. These IGF-binding proteins are expressed at different concentrations in different tissues and are thought to regulate the activity of IGF I and II. The gene is organized in four exons and spans 5.9 kb. The IBP-1 gene is a single copy gene, located on chromosome 7. 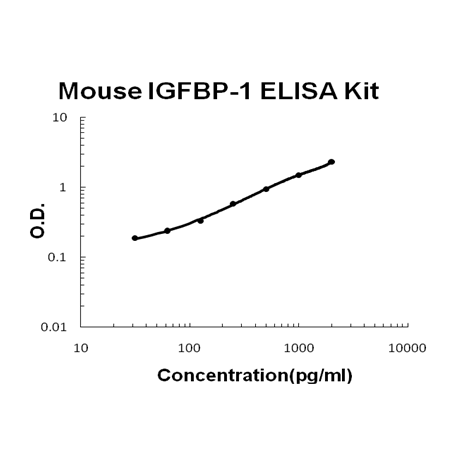 The standard product used in this kit is recombinant mouse IGFBP-1, consisting of 247 amino acids with the molecular mass of 27KDa. A: Baculovirus was not used in the production of EK0383.